Arai S., Griffiths L.G., Mama K., Hackett T.B., Monnet E., Boon J.A., Carter L., Orton E.C. Bioprosthesis valve replacement in dogs with congenital tricuspid valve dysplasia: techniqueand outcome // J Vet Cardiol. 2011 Jun;13(2):91-9. 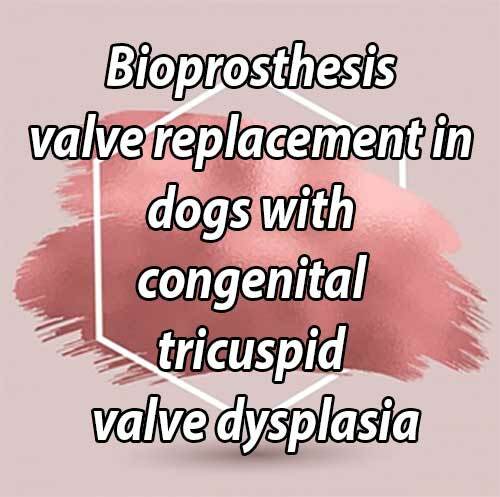 OBJECTIVE: To describe the surgical technique and report outcome of dogs undergoing bioprosthesis valve replacement for severe tricuspidregurgitation (TR) secondary to congenital tricuspid valve dysplasia (TVD). ANIMALS, MATERIALS AND METHODS: Twelve client-owned dogs (19-43 kg) with TVD underwent tricuspid valve replacement with a bovine pericardial or porcine aortic bioprosthesis with the aid of cardiopulmonary bypass. Anticoagulation with warfarin was maintained for 3 months after surgery and then discontinued. RESULTS: Ten of 12 (83.3%) dogs survived surgery and were discharged from the hospital. Seven dogs were alive with complete resolution of TR for a median period of 48 months (range 1-66 months) after surgery. Two dogs underwent euthanasia because of bioprosthesis failure due to inflammatory pannus at 10 and 13 months after surgery. Two dogs experienced valve thrombosis that was resolved by tissue plasminogen activator. One dog developed suspected endocarditis after surgery that was resolved with antibiotics. Serious cardiac complications included atrial fibrillation and flutter, right-to-left shunt through an uncorrected patent foramen ovale, complete atrioventricular block, and sudden cardiac arrest. Postoperative atrial fibrillation or flutter did not occur in 7 dogs treated prophylactically with oral amiodarone before surgery. CONCLUSIONS: Curative intermediate-term outcomes are possible in dogs undergoing open tricuspid valve replacement with a bioprosthesis. Prosthesis-related complications include inflammatory pannus, thrombosis, and endocarditis. Postoperative atrial fibrillation or flutter can be reduced or prevented by prophylactic preoperative treatment with amiodarone. Several identified complications are avoidable or can be reduced with increased awareness and experience with these techniques. Tricuspid valve dysplasia (TVD) is a congenital malformation of the tricuspid valve that occurs in dogs.1 Tricuspid valve dysplasia represents approximately 5% of congenital cardiac malformations in dogs.2 Labrador retrievers, Golden retrievers, German shepherds, and other large breed dogs are predisposed for the condition.2 The defect is known to be heritable in Labrador retrievers and is suspected heritable in other large breeds of dog.3 Tricuspid valve dysplasia is characterized by a spectrum of pathologic lesions including shortening, thickening, or notching of leaflets; shortening, fusion or absence of chordae; and direct attachment of papillary muscles to leaflets.1 The classic lesion is an immobile septal leaflet that is "tethered” by abnormal secondary chordae to the ventricular septum. Tricuspid regurgitation (TR) results from restrictive leaflet motion. Dilation of the tricuspid annulus contributes to progressive worsening of the TR. Tricuspid stenosis secondary to commissural fusion of the leaflets occurs infrequently. Although the natural history of tricuspid valve dysplasia in dogs is variable; progressive right heart dilation, right-sided congestion (ascites and/or pleural effusion), and premature death from progressive heart failure are frequent outcomes. 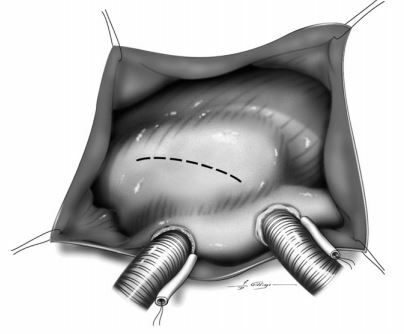 Valve replacement with a bioprosthesis is a possible curative treatment for severe TR. In this study, we report the technique for tricuspid valve replacement with a bioprosthesis and outcome in 12 dogs with severe TR secondary to tricuspid valve dysplasia. Dogs underwent preoperative evaluation consisting of complete blood count, serum chemistry panel, urinalysis, coagulation panel, blood type, thoracic radiographs, and transthoracic and Doppler echocardiography. Diagnosis of congenital tricuspid dysplasia was based on echocardiographic findings of severe TR, restrictive motion of the septal leaflet or both leaflets, malformations of the chordae tendineae, and right heart dilation. Indication for surgery was severe tricuspid regurgitation (color- flow Doppler turbulence > 50% area of right atrium) secondary to congenital tricuspid dysplasia, severe right ventricular dilation, and hepatic venous congestion. Dogs with severe medically-refractory ascites or pleural effusion were excluded. Oral amiodarone was not administered before surgery in the first 5 dogs operated in this series. Prophylactic oral amiodarone (10—15 mg/kg/day) was administered for 7 days before surgery to reduce the risk of postoperative atrial fibrillation or flutter in the last 7 dogs operated in this series. Amiodarone therapy was not continued after surgery. Figure 1 The heart was exposed through a right 5th intercostal thoracotomy (orientation shows ventral aspect of heart at top). Angled cannulae were placed in each vena cavae for cardiopulmonary bypass. An incision was made in the right atrium to expose the tricuspid valve. The right atrium was opened by an incision dorsal and parallel to the atrioventricular groove (Video 1). The tricuspid valve was inspected for malformations typical of tricuspid valve dysplasia (Fig. 2). The tricuspid leaflets were excised (Fig. 3). 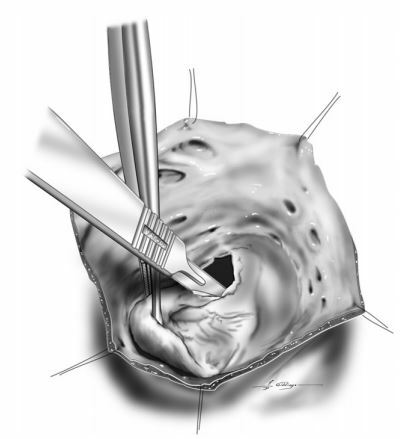 Pledget-buttressed 2-0 polyester sutures were placed in the tricuspid valve annulus (Fig. 4). The annulus was measured with a valve prosthesis-sizing device (Fig. 5). A bovine pericardialc or porcine aortic valved bioprosthesis was chosen for implantation. Mattress sutures were placed through the sewing ring of the prosthesis (Fig. 6). The valve prosthesis was seated into the tricuspid annulus and sutures were tied. The right atrium was closed with continuous mattress pattern oversewn with a simple continuous pattern. CPB was discontinued and the cannulae were removed. A thoracostomy tube was placed through the right thoracic wall and the thoracotomy was closed. Figure 2 The tricuspid valve was inspected for abnormalities typical of valve dysplasia including tethering of the septal leaflet to the interventricular septum (A) and direct insertion of papillary muscle to the valve leaflet (B). Figure 3 The tricuspid valve leaflets were excised 2—3 mm from the valve annulus. The annulus was carefully identified during leaflet excision by lifting the leaflet and allowing it to be trans-illuminated from beneath. Sutures should not be placed too deeply to avoid injury to coronary vessels along the mural leaflet and atrioventricular conduction tissues along septal leaflet. 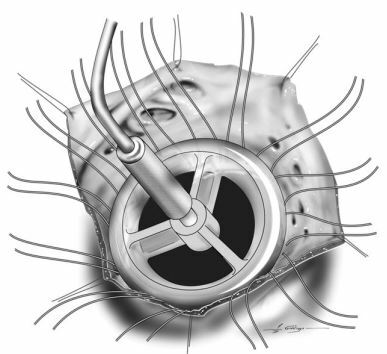 Figure 4 Pledget-buttressed mattress sutures were placed into the valve annulus with the pledget oriented on the ventricular side of the annulus (A). Fourteen to 16 mattress sutures were placed around the full circumference of the annulus (B). Plication of the dilated annulus was accomplished by taking wide bites within each mattress suture, while simultaneously placing mattress sutures close together to avoid perivascular leak around the prosthesis. The anticoagulation protocol was adapted from the American College of Cardiology — American Heart Association guidelines for implantation of surgery. Ventilatory support consisted of spontaneous ventilation with inspiratory pressure support (2—8 cm H2O), supplemental oxygen (FIO2 0.4—0.8) and positive end-expiratory pressure (5—10 cm H2O) until extubation. Levels of ventilatory and oxygen support were based on the arterial blood gas analysis. Adequacy of cardiac output was assessed by blood lactate, arterial blood pressure, and venous oxygen saturation. Arterial blood pressure was measured directly with an arterial catheter. Inotropic and vasopressor support after surgery consisted of combinations of dobutamine (2—5 mg/kg/min IV), milrinone (0.1—0.5 mg/kg/min IV), epinephrine (0.05—0.4 mg/kg/min IV) and/or phenylephrine (0.5—1 mg/kg/min IV). Shed blood from the thoracic cavity was collected and washed with a cell saver.e Washed autogenous and allog- enous red blood cells were administered IV as needed to keep the hematocrit above 30%. Fresh frozen plasma was administered as needed to keep the total solids above 4.0 g/dl. Lidocaine (70 mg/ kg/min IV) was administered for at least 24 h to diminish the risk of ventricular tachycardia. Figure 5 The valve annulus was measured with a valve sizing device to determine the proper size for the valve prosthesis. valve bioprostheses in the mitral position in humans.12 Activated partial thromboplastin time (APTT), prothrombin time (PT), and activated clotting time (ACT) were monitored to assess coagulation status. Heparin (50—100 U/kg SC q 6 h or 12—20 U/kg/h IV) was administered once postoperative bleeding had ceased (generally 24—48 h after surgery) and continued for 2—4 days. The dose of heparin was adjusted to cause a 25%—50% increase in the APTT or ACT. Warfarin was started on the second day after surgery (starting dose 0.08—1.2 mg/kg/day PO), continued for 3 months after surgery, and then discontinued. The international normalized ratio (INR) was calculated based on PT. The dose of warfarin was adjusted to a target INR of 2.5 (range 2.0—3.0). Dose adjustments consisted of 2%—10% changes in the total weekly dose (i.e. daily doses of warfarin could be different on different days of the week). Aspirin (20 mg/day) was started 1—2 weeks after surgery and continued for at least 1 year after surgery so long as it was tolerated. Twelve dogs with severe TR secondary to TVD underwent tricuspid valve replacement between 2005 and 2010. Signalment data for these dogs are shown in Table 1. The mean body weight was 27.9 kg (range 19.0—43.4 kg). All dogs had severe right atrial and ventricular dilation and hepatic venous congestion with or without mild ascites before surgery. Eleven of 12 dogs were on cardiac medications before surgery including furosemide (n = 2), angiotensin converting enzyme inhibitors (n = 10), beta-adrenergic receptor blockers (n = 7), digoxin (n = 1), spironolactone (n = 2), diltiazem (n = 1), pimobendan (n = 1), and amiodarone (n = 7). Two dogs had tricuspid stenosis (pressure half-time > 100 ms) in addition to TR; and one had undergone transcatheter balloon valvuloplasty for tricuspid stenosis before surgery. Concurrent congenital defects included patent foramen ovale, ostium secundum atrial septal defect, and mild pulmonic stenosis (Table 1). All dogs were in sinus rhythm before surgery. One dog had paroxysmal atrial tachycardia before surgery. 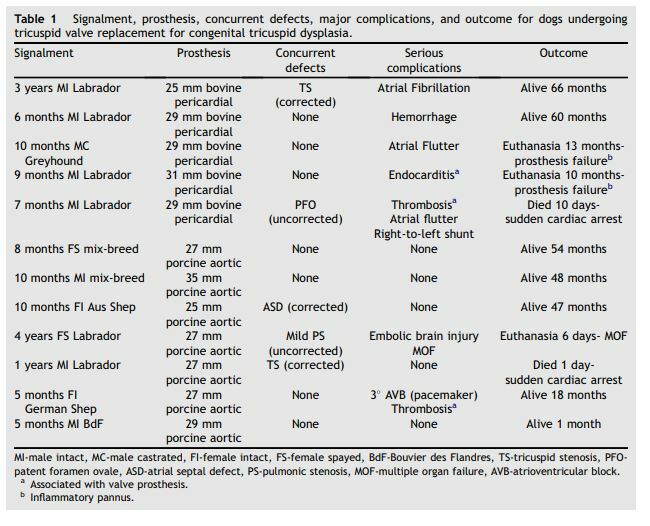 All 12 dogs underwent valve replacement with either a bovine pericardial or porcine aortic valve bioprosthesis of various sizes (Table 1). Ten of 12 dogs were discharged from the hospital (operative survival 83.3%). The median period of hospitalization after surgery was 6 days (range 3—7 days). Complications during hospitalization included hemorrhage, hypotension, right-sided congestion, low cardiac output, hypoxemia, ventricular tachycardia, and atrial fibrillation or flutter. Hemorrhage into the pleural space was seen in all dogs after surgery, and was considered severe in 1 dog. Hemorrhage lasted for a mean of 37.1 h (range 14—74 h). Median volume of shed blood was 26.7 ml/kg (range 1—146 ml/kg). Ten dogs had decreased mean arterial pressures (<70 mmHg) after surgery; and 7 of these dogs had increased blood lactate levels (>2.5 mg/dl). Atrial fibrillation or atrial flutter was seen during hospitalization in 3 of 5 dogs that were not pre-medicated with amio- darone. Two of these dogs underwent electrical cardioversion after surgery. One these dogs had recurrent atrial fibrillation and remained in chronic atrial fibrillation after surgery. Atrial fibrillation or flutter was not seen during hospitalization in 7 dogs treated prophylactically with oral amiodarone before surgery. Two dogs developed significant thrombosis of the valve prosthesis within 3 weeks after surgery. Thrombosis of the prosthesis was successfully resolved in both dogs by treatment with tissue plasminogen activator (0.2 mg/kg IV bolus, then 0.7 mg/kg IV over 30 min, then 0.5 mg/ kg IV over 1 h). One dog became febrile 6 days after surgery and was presumptively diagnosed with bacterial endocarditis of the valve prosthesis based on positive blood cultures (Enterococcus fecalis) and the presence of a suspected vegetative lesion on the valve prosthesis. Clinical signs of sepsis and the vegetative lesion resolved with antibiotic therapy consisting of amikacin (15 mg/kg IV once), ampicillin (22 mg/kg IV bid for 2 days), and amoxicillin-clavulanic acid (13.75 mg/kg PO bid for 6 weeks). One dog had intermittent complete atrioventricular block immediately after surgery. An epicardial dual-chamber pacemaker was implanted at the time of valve replacement surgery. Complete atrioventricular block became permanent in this dog. Two of 12 dogs did not survive to be discharged from the hospital. One dog developed central nervous signs on the 2nd postoperative day thought to be secondary to embolic brain injury, and underwent euthanasia 6 days after surgery because of multiple organ failure. The other dog suffered an unexpected sudden cardiac arrest 2 days after surgery and could not be resuscitated. Seven dogs discharged from the hospital were alive and had complete resolution of TR and clinical signs for a median period of 48 months (range 1—66 months) after surgery (Table 1). None of these dogs required long-term diuretic therapy after surgery. Two dogs underwent euthanasia 10 and 13 months after surgery because of progressive failure of the valve prosthesis. Histopathologic evaluation of the valve prosthesis from both dogs revealed inflammatory pannus characterized by formation of a fibrous envelope around the prosthetic leaflets and giant-cell inflammation. One of these dogs was the same dog treated for prosthetic endocarditis after surgery. One dog died suddenly 10 days after surgery. This dog had paroxysmal atrial flutter and intermittent cyanosis associated with an uncorrected patent foramen ovale. Table 1 Signalment, prosthesis, concurrent defects, major complications, and outcome for dogs undergoing tricuspid valve replacement for congenital tricuspid dysplasia. We have previously reported excellent short-term results for mitral valve replacement with a mechanical prosthesis in dogs.9 Unfortunately the long-term outcome was limited by a high incidence of prosthesis-related thrombosis. It is unclear from this experience whether dogs are more prone to the thrombotic complications associated with valve prostheses, whether relative inexperience in veterinary medicine with VKA (warfarin) was a contributing factor, or whether both played a role. Regardless of the reason, we concluded that mechanical valve prostheses are not currently a feasible option in dogs. Bioprosthetic heart valves consist of a glutaral- dehyde-fixed xenogeneic tissue such as bovine pericardium and porcine aortic valve mounted on a synthetic supporting framework. The principal advantage of bioprosthetic heart valves is lower thrombogenicity. There is class IIa evidence (weight of evidence favors efficacy) that humans who undergo implantation of bioprosthetic valves in the mitral position should undergo 3 months of VKA anticoagulation because of the risk of thromboembolism in the early postoperative period.12,13 The guidelines are silent with regards to bio- prostheses in the tricuspid position, but there is general consensus that prostheses in the tricuspid position are at least as prone to thromboembolism as prostheses in the mitral position. The principal disadvantage of bioprosthetic heart valves is their durability. Typically bioprosthetic valves start to show significant rates of structural deterioration 10—15 years after implantation.14,15 This is potentially less of a disadvantage in dogs that do not live as long as humans, assuming that the durability of bioprostheses in dogs is similar to that in humans. This study demonstrated that favorable intermediate-term outcome is possible in dogs undergoing tricuspid valve replacement with a bioprosthesis, without a need for long-term VKA anticoagulation. Five serious prosthesis-related complications occurred in 4 dogs of this study. Two dogs developed acute thrombosis of the valve prosthesis within the first 3 weeks after surgery. In both cases, valve thrombosis caused both functional stenosis and regurgitation of sufficient magnitude to result in acute life-threatening cardiac decompensation. In both cases, thrombosis was successfully resolved by emergent administration of tissue plasminogen activator. Fibrinolyic therapy is considered a reasonable first-line therapy for thrombosis of right-sided prosthetic heart valves according to American College of Cardiology — American Heart Association guidelines for human patients.13 Two dogs developed inflammatory pannus of the valve prosthesis ultimately resulting in progressive severe valve dysfunction and euthanasia at 10 and 13 months after surgery. Microscopic analysis of the valves confirmed classic changes of inflammatory pannus characterized by giant-cell granulomatous inflammation and formation of a thick fibrous envelope that immobilized the prosthetic leaf- lets.16,17 Inflammatory pannus is considered a rare cause of prosthetic valve dysfunction in humans.15,18 It can occur with both mechanical prostheses and bioprostheses. The pathogenesis of inflammatory pannus is incompletely understood, but is widely believed to result from a persistent foreign body-type reaction to the synthetic and biologic materials of the prosthesis.16 Prosthesis design, surgical technique, inadequate anticoagulation, and endocarditis are all possible contributing factors.17 The fact that 2 dogs in this series developed this devastating complication suggests that inflammatory pannus could be a more important complication in dogs than it is in humans. It is perhaps important that both dogs developing severe inflammatory pannus had a bovine pericardial bioprosthesis. For this reason, we discontinued implantation of bovine pericardial bioprostheses in favor of porcine aortic bioprostheses midway through this series. One dog that developed inflammatory pannus had acute endocarditis in the early postoperative period. Even though clinical signs of sepsis and the vegetative lesion quickly resolved with intravenous antibiotics, it is possible that endocarditis was a triggering event for subsequent pannus formation in this dog. Serious postoperative complications not directly related to the prosthesis included atrial fibrillation/ atrial flutter (3 dogs), complete atrioventricular block (AVB) (1 dog), right-to-left shunt through an uncorrected patent foramen ovale (1 dog), embolic brain injury (1 dog), and sudden cardiac arrest (2 dogs). These complications caused or contributed to early postoperative death in 3 dogs in this series. Postoperative atrial fibrillation or atrial flutter occurs in up to 40% of human patients undergoing open heart surgery.19,20 Preoperative oral amiodar- one administered for at least 7 days before surgery has been shown to significantly decrease the incidence of postoperative atrial fibrillation and atrial flutter in humans.19,20 Dilation of the tricuspid annulus secondary to tricuspid valve dysplasia likely further predisposes dogs with this condition to atrial flutter.21 Three of the first 5 dogs operated in the series developed postoperative atrial fibrillation (1 dog) or atrial flutter (2 dogs) before discharge from the hospital. These arrhythmias complicated the management of these dogs and prolonged their hospitalizations. As a result, prophylactic oral amiodarone was administered to all subsequently operated dogs in this series. None of the seven dogs administered prophylactic amiodarone developed early postoperative atrial fibrillation or flutter. The atrioventricular conduction system is susceptible to injury by surgeries that involve placement of sutures and/or devices close to the ventricular septum. AVB is a well-recognized complication of atrioventricular valve replacement. Iatrogenic injury to the atrioventricular conduction system was the most likely cause of AVB in 1 dog in this series. Two dogs in this series experienced sudden cardiac arrest and death. One of these dogs had serious morbidity associated with right-to-left shunt through an uncorrected patent foramen ovale and paroxysmal atrial flutter. The outcome in this dog emphasizes the importance of screening dogs for PFO before surgery and, if present, correcting it during surgery. Sudden cardiac death was unexpected in the other dog. One dog in this series underwent euthanasia because of a devastating embolic brain injury. This was most likely a complication of CPB. In our view, many of the complications identified in this case series are avoidable or can be reduced with increased awareness of their potential and experience with these techniques. Important lessons from this case series include meticulous anticoagulation in the early postoperative period, prophylactic medical therapy to prevent postoperative atrial fibrillation and flutter, preoperative evaluation for PFO, inspection of the atrial septum during surgery and correction of PFO if present, prophylactic antibiotic therapy until all intravenous catheters are removed, meticulous de-airing of the heart after CPB, and avoidance of deep suture placement near the ventricular septum. Twelve dogs with severe TR secondary to congenital tricuspid valve dysplasia underwent valve replacement with a bioprosthesis. The following conclusions were drawn from this case series: a) Curative intermediate-term outcomes are possible in dogs undergoing this surgery without a need for long-term anticoagulation, b) Prosthesis-related complications include inflammatory pannus, thrombosis, and endocarditis wherein the latter two complications are treatable, c) Postoperative atrial fibrillation or flutter in dogs undergoing this surgery can be reduced or prevented by prophylactic preoperative treatment with oral amiodarone, and d) Several serious complications identified in this case series are avoidable or can be reduced with increased awareness of their potential and experience with these techniques. The authors thank F.D. Giddings for the illustrations. Liu SK, Tilley LP. Dysplasia of the tricuspid valve in the dog and cat. J Am Vet Med Assoc 1976;169:623-630. Andelfinger G, Wright KN, Lee HS, Siemens LM, Benson DW. Canine tricuspid valve malformation, a model of human Ebstein anomaly, maps to dog chromosome 9. J Med Genet 2003;40:320-324. Orton EC. Cardiac surgery. In: Tobias K, Johnston S, editors. Small animal surgical practice. St Louis: Elsevier; in press. Monnet E, Orton C, Gaynor J, Boon J, Wagner A, Linn K, Brevard S. Open resection of subvalvular aortic stenosis in dogs. J Am Vet Med Assoc 1996;209:1255-1261. Orton EC, Mama K, Hellyer P, Hackett TB. Open surgical repair of tetralogy of Fallot in two dogs. J Am Vet Med Assoc 2001;219:1089-1093. Martin J, Orton EC, Boon J, Mama K, Gaynor JM, Bright JM. Surgical correction of double-chambered right ventricle in dogs. J Am Vet Med Assoc 2002;220:770-774. Griffiths LG, Boon J, Orton EC. Evaluation of techniques and outcomes of mitral valve repair in dogs. J Am Vet Med Assoc 2004;224:1941-1945. Orton EC, Hackett TA, Mama K, Boon JA. Technique and outcome of mitral valve replacement in dogs. J Am Vet Med Assoc 2005;226:1508-1511. Orton EC, Lehman T. Management after cardiopulmonary bypass. In: Silverstein DC, Hopper K, editors. Small animal critical care medicine. St Louis: Saunders Elsevier; 2009. p. 647-650. Orton EC. Postcardiac surgery management. In: Silverstein DC, Hopper K, editors. Small animal critical care medicine. St Louis: Saunders Elsevier; 2009. p. 645-647. Bonow RO, Carabello BA, et al. 2008 Focused update incorporated into the ACC/AHA 2006 guidelines for the management of patients with valvular heart disease: a report of the American College of Cardiology/American Heart Association Task Force on practice guidelines (Writing committee to revise the 1998 guidelines for the management of patients with valvular heart disease): endorsed by the Society of Cardiovascular Anesthesiologists, Society for Cardiovascular Angiography and Interventions, and Society of Thoracic Surgeons. Circulation 2008;118:e523-e661. Salem DN, O'Gara PT, Madias C, Pauker SG. Valvular and structural heart disease: American College of Chest Physicians evidence-based clinical practice guidelines (8th Edition). Chest 2006;133(6 Suppl):593S-629S. David TE, Armstrong S, Maganti M. Hancock II bioprosthesis for aortic valve replacement: the gold standard of bioprosthetic valves durability? Ann Thorac Surg 2010;90: 775-781. Rizzoli G, Bottio T, Thiene G, Toscano G, Casarotto D. Longterm durability of the Hancock II porcine bioprosthesis. J Thorac Cardiovasc Surg 2003;126:66-74. Oda T, Kato S, Tayama E, Fukunaga S, Akashi H, Aoyagi S. Pannus overgrowth after mitral valve replacement with a Carpentier-Edwards pericardial bioprosthesis. J Artif Organs 2009;12:55-57. Sakamoto Y, Hasimoto K, Okuyama H, Ishii S, Shingo T, Kawawa H. Prevalence of pannus formation after aortic valve replacement: clinical aspects and surgical management. J Artif Organs 2006;9:199-202. Yankah CA, Pasic M, Musci M, Stein J, Detschades C, Siniwaski H, Hetzer R. Aortic valve replacement with the Mitroflow pericardial bioprosthesis: durability results up to 21 years. J Thorac Cardiovasc Surg 2008;136:688-696. Daoud EG, Strickberger SM, Man KC, Goyal R, Deeb GM, Bolling SF, Pagani FD, Bitar C, Meissner MD, Morady F. Preoperative amiodarone as prophylaxis against atrial fibrillation after heart surgery. N Engl J Med 1997;337: 1785-1791. Wurdeman RL, Mooss AN, Mohiuddin SM, Lenz TL. Amio- darone vs. sotalol as prophylaxis against atrial fibrillation/ flutter after heart surgery: a meta-analysis. Chest 2002; 121:1203-1210.
de Madron E, Kadish A, Spear JF, Knight DH. Incessant atrial tachycardias in a dog with tricuspid dysplasia. Clinical management and electrophysiology. J Vet Intern Med 1987; 1:163-169.